Since you have invested this much time, how about investing a little more time to understand what CSI is all about? CSI is dedicated to “Building Knowledge, Improving Project Delivery”. Quality Construction Projects delivered on-time and on-budget! CSI is a voluntary organization of members dedicated to the efficacy of specifications in the construction industry. The mix of architectural members and product representatives with specific, in-depth knowledge of their products provides a perfect opportunity to meet the needs of Architects in the constantly evolving construction industry. Our business members benefit by keeping architects apprised of the best practices and newest technology to be the preferred product when possible. The Architect benefits by being knowledgeable of best products and practices to his/her customer. In today’s competitive just-in-time environment more construction projects are handled with less specialization. The Project Architect has many responsibilities. Successfully specifying products using the expertise of industry members gives you the best chance for success. So can you consider coming to the next meeting? We can always use more input from new professionals and industry representatives! Do You Know Someone Who Would Enjoy the Benefits of a CSI Membership? For somebody considering membership in CSI, "The amount of reward is proportional to the amount of effort extended. Take a risk and become involved in a worthwhile organization that could range from Chapter to Institute level activities where your degree of effort and fulfillment will take you as far as you want to go, learning throughout the process." 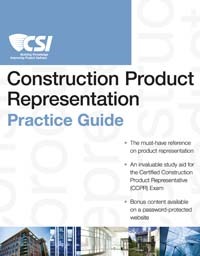 CSI now has hard copies of of the Practice Guides for review. Please contact Miki Vargo at mdvargo@gerardassociatesarchitects.com.